It has been a little while since I posted anything, so I thought I'd get back into the swing of things with a tutorial. There are many times when I've found the need for a wooden floor. 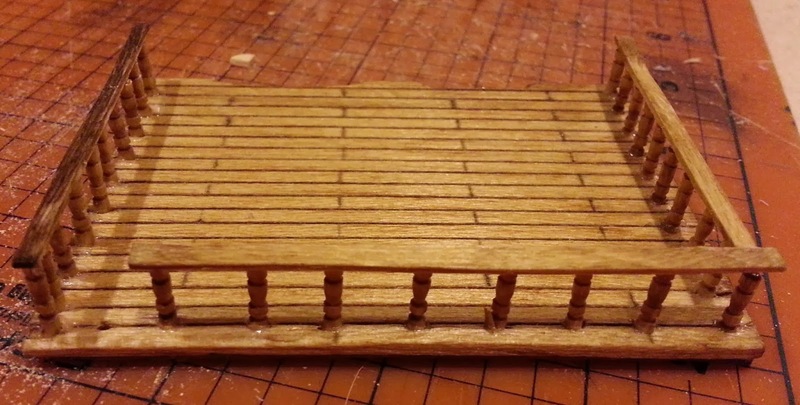 Ship decking, regular flooring, a second story in a model building...the need does arise. Along with this need, I occasionally have to make accompanying railing. After all, you don't want your miniatures to fall off when the ship, second floor, etc are moved! Also, I like railings to add a touch of realism to the terrain. A wargaming win-win in my book. If you've followed this blog (instead of chancing upon this page), then you may remember the western shootout set in a trading post/lodge. I wanted to finish that piece, so I inked it, built a couple of walls to create rooms and added a second floor. It wasn't until I finished that project that I thought about blogging the creation of floors and rails for the second floor. Blame it either on me being on Spring Break and thus mentally relaxed, or the fact that I'm also confined with my two darling, but really rather distracting children. Or don't. Whatever. I digress. What you'll need: a sharp razor blade, a mechanical or sharp regular pencil, balsa wood that is large enough to use as your desired floor, toothpicks, craft sticks, hand drill, a ruler (preferably clear), thin cardboard or matte board large enough to go under the balsa wood as reinforcement, white glue (I use Aleene's Tacky Glue), scissors, paints, stains, etc of your choice, self-healing cutting board or comparable surface. Step 1: Figure out the dimensions of the floor you'll be creating. If your balsa wood isn't wide enough, keep in mind that you can put pieces side-by-side as long as you keep the wood grain heading the same direction. Mark and cut with the wood grain. Remember to use your self-healing cutting mat, or at least cut on a surface you don't mind scarring! Your razor blade is merciless...wood, flesh, mat...it'll cut 'em all! Step 2: Take your ruler and mechanical pencil. Again, look at the direction the wood grain is going. 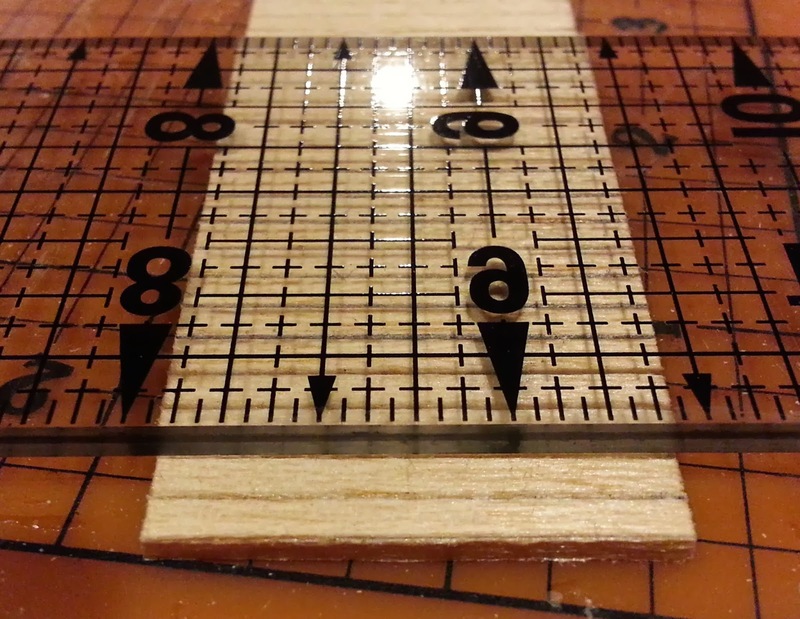 When you etch the balsa wood, you'll want to go with the grain, not against. As you can see in the following picture, my ruler is clear acrylic with measurement lines, which makes lining up my etches a piece of cake. 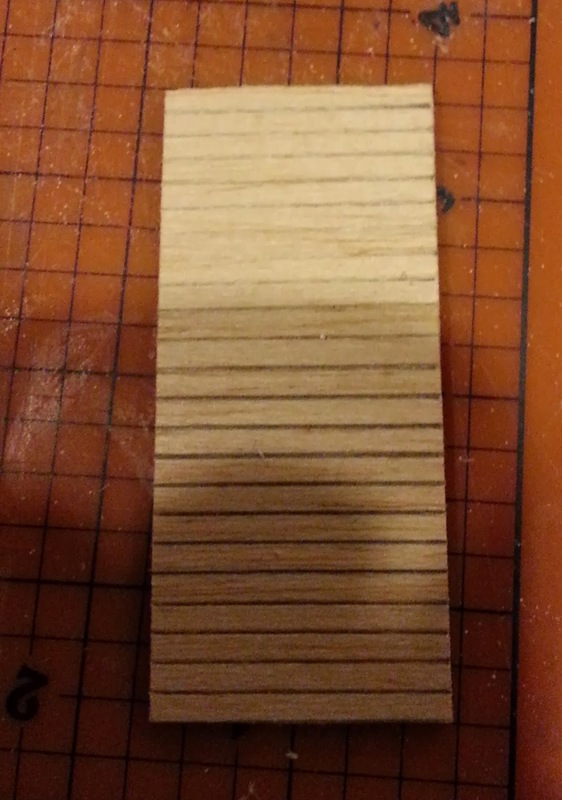 If your ruler isn't as functional, I've found 1/4" to be the ideal width for 28mm 'wooden boards'. The reason for using a mechanical pencil is simple: The lead easily scores the balsa wood, but not so deeply that it cuts it entirely apart. It also leaves a nice dark line that instantly gives your floor some depth. When you add the cross etches, simulating the edges of boards, remember to etch every other line. For instance, in the picture above, I may start with an 'end etch' in the middle of the bottom board, then continue it on boards 3, 5, 7, etc. I'd then put another 'end etch' on the left side of board 2, then 4, 6, etc. The pattern looks great when finished. Of course, you could also completely randomize your 'end etches'...just make sure that your board lengths are the same. 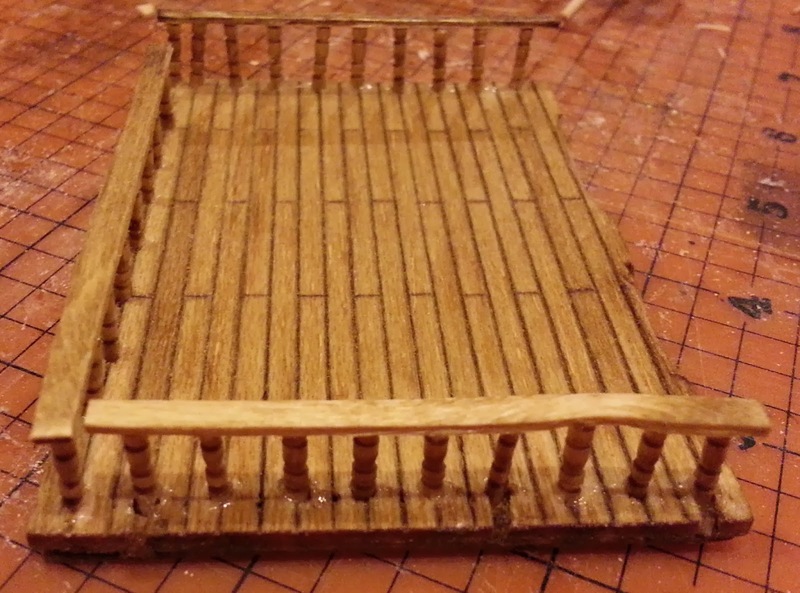 No bad carpentry, even in miniature! As you can see, the tops of these little guys are perfect for spindles. Since I'm not wanting the entire toothpick, I cut off the top 1/2", making sure that I keep the shafts for future projects. Waste not, want not, right? When you've cut a goodly amount of these bad boys (30ish), it's time to move on. Step 4: I have a handy hand drill. It's a little expensive, but very useful. 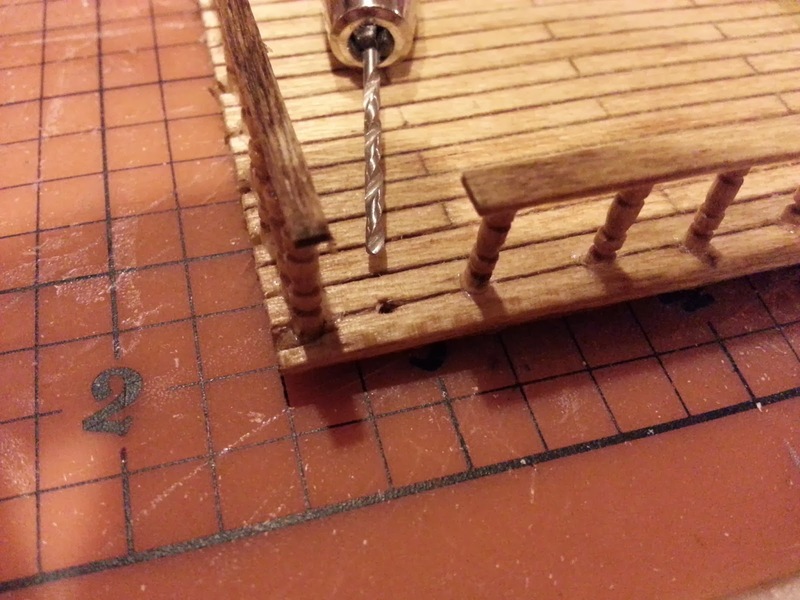 Its use today is to pre-drill holes in the balsa wood so I can anchor my spindles. Knowing that balsa wood splits easily, I try to drill far enough from the edge that it isn't an issue. I drilled about every 1/2", all the way through the balsa. I'll be honest and say that I eyeballed distances. When push comes to shove, the effect is what I'm wanting. Most gamers won't criticize if you're off by a smidgeon. I dry fit the spindles to make sure the holes work, then I put a dab of Aleene's in each hole. Put the spindles back into the holes, making sure that they are the same height. If you don't, then your railing isn't going to lay right. Let 'em dry. Aleene's turns clear when dry, so it's easy to tell when the piece is ready for the next step. Step 5: Railings. I have an assortment of craft sticks on hand. I think the ones I used for this project were actually stir sticks from Starbucks or some similar coffee joint. I cut off the ends with scissors, then using my razor blade and mat, cut them lengthwise in half. You can see that the cut piece isn't perfectly straight. That's fine for my lodge project, as they're for a log cabin and not a modern home. 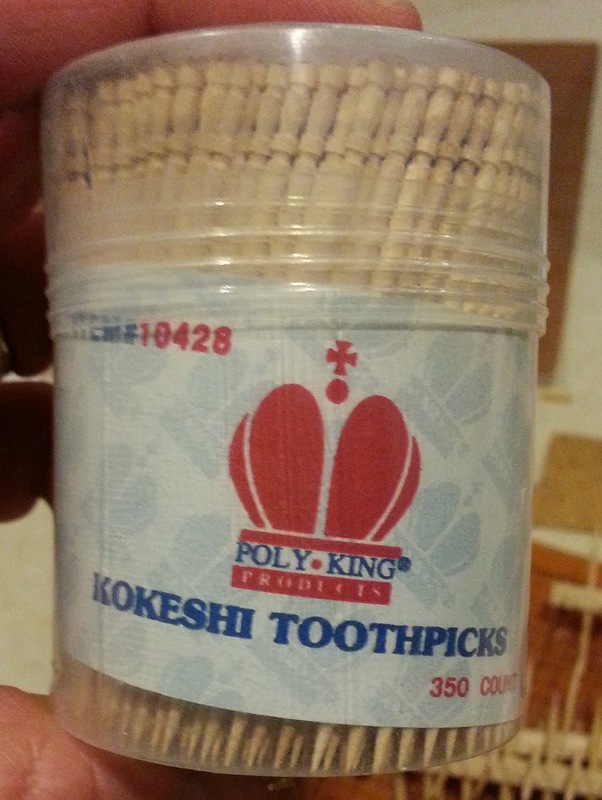 Otherwise, please pay attention to your craft sticks' straightness and if there are any knots in the wood. Knots can be a pain to work around! Cut the 'railtops' to the desired length. Place a dollop of glue to the top of each spindle and place the railtop in the desired position. Let dry. Step 6: Cut the thin cardboard or matte board out in a shape that is slightly smaller than the surface area of the balsa wood. 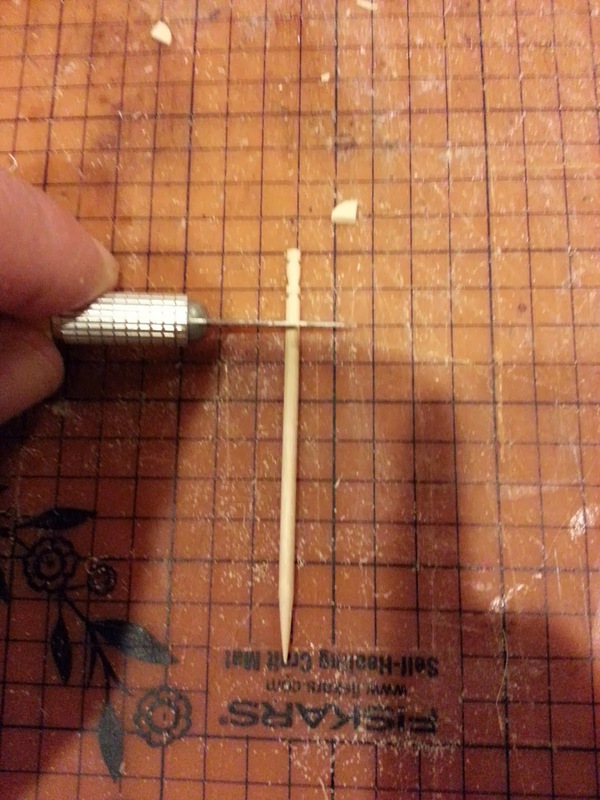 You want to make sure the piece is small enough be on the inside of your drilled holes, but still large enough to effectively strengthen the balsa. I learned this the hard way. I attached my cardboard before drilling, shaped big enough that the holes were messy. The result? The undersides of my lofts are ugly and caused me some fit issues when I was done. Step 7: Paint, varnish, stain, ink wash as you see fit. You're done! Here is how one of my second-story lofts turned out. Note the patterning of the board ends. If you didn't understand what I meant in Step 2, the pics may help! I hope you get something out of this tutorial. Happy building!